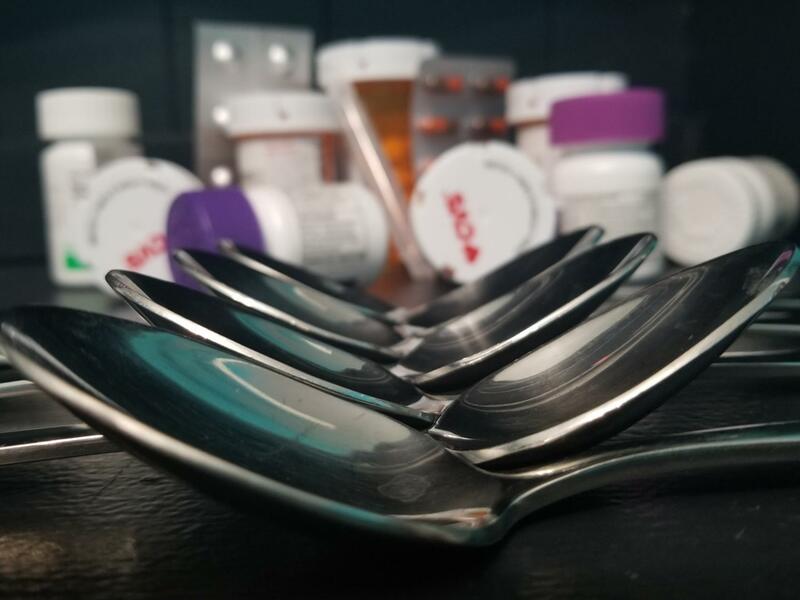 Spoons are commonly used by chronically ill individuals to describe fatigue to healthy people living without chronic conditions. Copy editor Kaitlyn Piggott discusses what it is like to live with chronic illnesses. There is a girl sitting in a math class. She intently listens to the teacher and follows along in her notes. She answers the questions when called upon but doesn’t go out of her way to speak up. She keeps to herself, smiles and doesn’t bother anyone. Doesn’t seem too odd, right? She is a chronic liar. What is not visible is that her heart is collapsing onto her chest in painful palpitations. It is racing so fast that she can hear it in her ears. Her joints ache with no clear indication as to why. There is pounding in her head so intense that it kills her slightly to look into the light. The overwhelming feeling to itch is running up her body and her throat begins to swell. Her stomach growls and she swallows what comes up into her mouth. When she gets up to stand, she plasters on a smile to try to fool everyone around her while she sees her world go into a swirl of black and white dots. If someone were to ask her how she was, “fine” or “alright” would sputter out of her mouth like rapid fire. In the end, she could fool the world behind that smile but, it’s about time she didn’t. She is me. To give some background, I have four and a half chronic illnesses. It is hard to call a blood disorder, mine is both a platelet storage and function defect, anything but half a chronic illness when it only affects me when I get a bloody nose, major accidents, surgeries, pain management and monthly. As for the others, I have POTS (Postural Orthostatic Tachycardia Syndrome), which in much simpler terms, just means that my heart rate skyrockets every time I so much as dare to stand. This means that I have symptoms of over-exercising, while I’m sick, fasting and have been awake for the past three days. It never stops. The next is gastroparesis, which means partial paralysis of the stomach, so it just sits there. When my doctor told me that gastroparesis is one of the most painful gastric illnesses since it is both a mobility and a physiological issue, it isn’t a comforting fact. I am nauseated 24/7 and have terrible pain. Also, I have hypermobile Ehlers-Danlos Syndrome (EDS) which is a connective tissue disorder. It means that I have pain in all of my joints. They ache and stab on an almost constant basis. Then, the kicker, the recently diagnosed, very hard to manage and still little well known about Mast Cell Disease. I am allergic to life itself: perfumes, scents, heat, chill, noise, food; just name it, it probably will get my throat to close up. Due to the numerous issues that I have, I have two cardiologists, a rheumatologist, a gastroenterologist, an immunologist, a geneticist, an orthopedic surgeon and a hematologist, most of whom I see on a rather frequent basis and a shoe-box filled with medications that I take daily. Given all of this, I pretty much feel like death walking. Just getting up to take on the day takes the life out of me. Taking a shower wipes out my entire evening, and I lay on the ground struggling to move at all. School in itself is a constant cycle of destruction. I have missed more than a third of my junior year. It doesn’t matter how smart I am, how hard I work, missing that much of school isn’t a good idea. My health has halted me from living the life I want. So what is the point of me telling my story? I’m hoping that maybe if my story is told, that someone like me can tell their friends, the ones who care. Also, it would be nice for a such a large school as this that calls us the “Troy High Family” to actually show some compassion; and yeah, I don’t look sick, but looks can be awfully deceptive. I have come to know that my silence comes from the fact that the some of the people I have told have fallen short. With most of the people I have told, I have to prove that I am sick. Let me just say this, if I were to fake an illness, I would have chosen one that people are more familiar with. When I have to continue to prove that I am unwell, I am less likely to tell the full truth. All of my illnesses are considered to be “invisible.” They are not known to be apparent until I’m are lying on the ground because I fainted. This can make it more than challenging to discuss my struggles with others. People cannot begin to comprehend, and to be blunt, I wouldn’t have either. I would never want someone to understand the daily pain of living with these illnesses, but sometimes some compassion, not sympathy, would be nice. 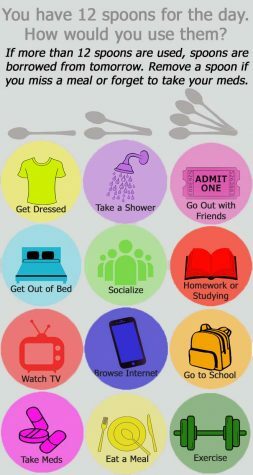 Since being drafted into the “chronic illness community,” I have adopted the fatigue and lack of energy metaphor as the spoon theory. The theory attempts to explain energy loss in chronically ill individuals to healthy people. It is important to note that fatigue is much worse than being tired. The theory states that someone has a restricted amount of spoons when they wake up in the morning; it differs for each person, but for examples for me, I might only get twelve spoons to start off with it might take two spoons to get out of bed and make my bed, another three spoons to eat and get dressed, then, going to school, which takes four spoons, and now I only have three spoons to make it through the rest of the day. If I had a bad day or week prior, I will tend to start the day off with far fewer spoons than I normally would. POTS patients will often refer to themselves as a Potsies and a Spoonies because of this theory. One of the major difficulties with living with a chronic illness is a person rarely just has one. I went to my cardiologist the other day. She sees me for my POTS, and we hadn’t been to her since the official diagnosis of mast cell, and when we told her, she went into a large lecture. She was saying that there are many illnesses closely associated with the chronic illnesses I have. Oftentimes, people call the major ring of illnesses the trifecta. My cardiologist says that the trifecta includes POTS, mast cell and EDS while my allergies includes gastroparesis instead of the EDS. The problem with this is there are so many other conditions that can come from these illnesses. For me, I am still pretty early into the chronic illness life. I am still searching for more answers to symptoms that don’t exactly fit into my official diagnosis. For example, my gastroenterologist doesn’t believe that my GI issues are strictly gastroparesis, otherwise, I would have seen relief by now, so he wants to look for other conditions with a scope. The problem I have with it all is it never stops. I have had a new diagnosis and new symptoms at such a rapid pace for the past year that I am just trying to keep up. I have so many doctors that I see them more than I see my friends. There is so much anger at life boiled up in me because I’m not normal and I’m not healthy and no one can truly understand my life. This is where the lack of knowledge leads to lack of compassion and added agitation which isn’t completely anyone’s fault; but chronically ill individuals can start to feel isolated and feel like they are alone on an island which I have felt before. Awareness is the key to changing the atmosphere surrounding chronic illnesses. Most people know the definition of chronic but when someone is actually living with a lifelong illness, it can be easy to think “how are they still sick?” Trust me, I wish I wasn’t sick. I wish I could do all the things I used to be able to do but I can’t. This issue lays both within people like me, who fake it until we make it, and the society where some people just don’t care. I’m not expecting this community to care or even attempt to understand, but some kindness would go a long way. We’re all going through something. My life is a struggle to keep going and I could continue to pretend like it isn’t, but it is. It is a struggle. I’m angry. I’m upset. I’m sick. Most of all, I grieve the person that I used to be and still struggle to come into terms with the fact that this won’t go away. I long to do everything that I used to. When I became sick, I never thought that the girl I used to be would be just a memory in my head and I would be holding onto her so tightly. Writing this isn’t going to change any of that, but now the world knows. Now, the world knows that I am the warrior that I have always meant to be. My illnesses are invisible, but I am not. See me for who I am and what makes me who I am. Look around—there are so many people with obstacles in their lives, so don’t give someone the stink eye when they go into the elevator; the reason they are going in may not be apparent. Hold open the door for someone. The rough morning they had may be hidden behind that grin. Smile at someone in the hallway, it might just make their day. Life can be a struggle but it has its highs and lows. Some compassion could change the world. I’m a chronic liar no more. OMG!! what an amazing article from such a talented young lady! More people need to be aware of this chronic illness. More needs to be done. Wonderful articulate, informative article by Kaitlyn Piggott. It takes a great “strength of character” to write what you have here. Possibly even more strength than you may believe you even have. I sure respect what you have shared. This has certainly challenged me to become more compassionate toward others. My name is Luis and I believe we met eight years ago. I flew down for a few days from El Paso to see our new system with your dad. I remember eating pizza with you all and I’m sure I met you then. I am touched by your story and I want to wish you the best. I know that may sound difficult but also my prayers go out to you. You are a brave girl. Please be strong. Kaitlyn, You are a very special person with immeasurable talent and courage. In sharing your experience, I am sure you’ve inspired many people, myself included, to be more compassionate. Also, there are no doubt many people who are going through similar turmoil and pain with chronic illness. And I know they would thank you for sharing your story. Those who know and love you must be very proud of you. As a person who has the honor of speaking to you every day I can only say how amazing you are. My only input to you is to continue to pursue your dreams. Kaitlyn, this is your 2nd cousin, Christie. Uncle John’s niece. I am glad that I got to read this article. I was diagnosed with Bipolar Disorder and Severe Social Anxiety Disorder when I was in my late 30’s and recently found out that I have Type 2 Diabetes and Severe Anemia. I can understand what you are going through when it comes to people thinking you are not sick. I have heard that so many times it isn’t funny. People say, “Sometimes you just have to push through it”, “If you don’t focus on it”, or “She’s not really sick. She just wants attention”. It’s so aggravating and sometimes I want to yell at people. I don’t because I try to let God handle it. I thank you for this article, it is very encouraging and lets me know that I am not alone. You will always be in my prayers. I love you and be blessed in Jesus name. This story really is going to help people better understand what you are going though. Even though it might seem like I’m not there for you sometimes know that I always am. I hope that you continue to tell us how you feel on any given day. I always have been there for you and will continue to be with you. You will never be able to get rid of me. Even if I annoy you sometimes please know that I love you very much. I had tears in my eyes as I listened to your words. Living with an invisible, chronic illness is hard. Your explanation is moving. By sharing your story, you’ve not only helped people understand; but you’ve given a voice to so many others who are affected by these types of illnesses. Thank you for writing this! I have been traveling to Indiana past two days. Got a rest from being behind the wheel and finally had opportunity to read about your amazing persistence pursuing your dreams, notwithstanding pain, discomfort, fatigue, complexity of managing your “shoebox” of meds and juggling spoons as needed surviving to end of day. Praying with YOU ALL THE WAY!! Even more so now with sharing your story. You are an amazing writer! This article is so honest….so clearly articulated…so inspiring. Thank you for sharing your thoughts this way. I believe your words will serve as an advocate for many who have ‘hidden’ chronic illness. You have a very special place in my heart. And my prayers continue to be with you for strength, healing, and wisdom. What a beautiful article. You are a warrior and your insight that none of us knows what others are facing and should show compassion is absolutely right. It will make the world a better place and you can change the world and you have for some with your beautiful writing. I have met your mother and she is kind and amazing too! We’ve never met but know john from the OU Champions board. I , being fortunate in not having any Chronic illness had no idea of the incredible kinds of issues you described and how consuming both physically and mentally. It takes an incredibly strong person to let this be spoken aloud. A huge tip of the hat to you as this was a huge step in sharing. What a story…I have tears in my eyes as I read it. You are strong, smart and a warrior. You are talented, an amazing writer. Thank you for sharing your story…Praying for you!